Barrier Free Living welcomes Blog contributor Julia Alberino. Julia retired in 2011 after more than thirty years as a health care administrator in both the public and private sectors. She was a frequent speaker at professional conferences, and co-founder of an advocacy group that worked to maintain and improve services for Medicaid beneficiaries, including elderly and disabled individuals. I’ve always been a cat person. When I moved into my lower Manhattan apartment in 1990, my cats came with me. At that time, pets weren’t technically allowed in the building, but the landlord looked the other way as far as cats were concerned. Some years later, the building was sold and the new landlord changed the policy to allow both dogs and cats. My neighbor across the hall adopted a beagle named Molly from a city shelter. I learned that she was taking Molly through pet therapy training, a concept that intrigued me. In reality, the benefits of pet therapy go far beyond that definition. Pet therapy animals are involved not only with persons with acute health problems or mental disorders, but also with persons who are disabled, have experienced trauma, or are elderly, or are children who may or may not have behavior or learning problems. For nearly two decades, Barrier Free Living has used pet therapy in its work with both people with disabilities, and survivors of domestic violence with disabilities at its shelters and programs. When Patricia Motus arrived at Barrier Free Living’s Transitional Housing program as the Occupational Therapy Consultant twelve years ago, there was already a therapy dog named Luca who visited once a week with her handler. 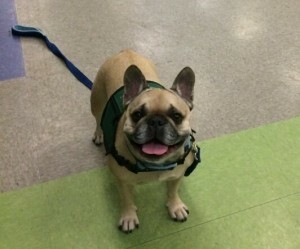 Patricia observed the beneficial effect Luca had on the residents with disabilities, and when Luca passed away, Patricia took her dog Nina, a French bulldog, through pet therapy training. Nina then became the pet therapy dog at the BFL transitional housing site downtown. 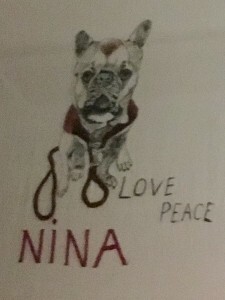 A resident at Transitional Housing made a pen-and-ink drawing of Nina on a T-shirt to express gratitude for the pet therapy sessions. When I visited Patricia in her office, I saw that the shirt was framed and occupied a central place. Through Patricia, I connected with Audrey Hendler, founder and driving force behind A Fair Shake for Youth. Audrey founded the organization in 2010 after teaching with Puppies behind Bars and observing the beneficial effect the pups had on the inmates. Audrey started A Fair Shake because she recognized that therapy dogs might help youth to build empathy and self-esteem and thereby reduce such problems as bullying. Audrey and her therapy dog Lucy are now one of 35 pet therapy teams currently involved in A Fair Shake. The organization focuses on middle school youth (ages 11-13), partnering with public schools and community agencies in Manhattan, the South Bronx, Brooklyn, and Queens, primarily in lower-income neighborhoods. A Fair Shake is currently active in ten sites, throughout the city including Barrier Free Living’s Freedom House domestic violence program. A Fair Shake has a ten-week curriculum, where participants learn to cooperate with each other to teach the dogs such things as going through the obstacle tunnel. The youth learn compassion and respect for each other while interacting with the dogs, notes Audrey. The youth learn to communicate with each other and with the dogs, and strengthen their communication skills and ability to interact in social situations. At Freedom House, Audrey has modified the curriculum to take into account the fact that the age range of the participants goes beyond 11-13. Any child/youth residing at Freedom House who wants to participate is allowed to do so. This is different from the program in the middle schools, in which the schools may have specific selection criteria for participation. Audrey says the Fair Shake teams working at Freedom House find the work especially rewarding, as they witness the participants, whose lives have been disrupted by domestic violence, learn to communicate with the dogs, the handlers, and with each other. Pet therapy, clearly impactful, is yet another, perhaps less conventional, way that Barrier Free Living serves its residents. This was a really interesting and enlightening blog post. I didn’t know much about these programs, but I can see the healing power.